This item is no longer manufactured. Arista APHS Premium Halftone Supreme Ortho Litho film is an excellent quality graphic arts film that is a replacement for Kodak Kodalith Type III Ortho Litho film. When developed in standard A/B Lith film developer this film will yield high contrast (black & white only) results as well as excellent halftones when exposed on a copy camera with a line screen. Arista APHS Premium Halftone Supreme Ortho Litho film is also used by many photographers for use in creating highlight masks for fine art printing and for creating enlarged negatives, in a two-step process, for contact printing and alternative processes. Continuous-tone results can be achieved by using a dilute working solution of standard paper developer. Dektol 1:7 or 1:9 is a popular dilution to achieve continuous tone results. Ethol LPD, Agfa Neutol, Clayton Extend Plus, Clayton P-20, Nacco Printol, or any of our Arista and Arista Premium Paper Developers are also recommended. Your individual optimal dilution and developing time will vary based on your desired results. 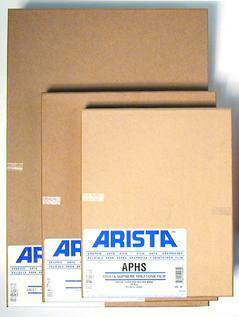 Arista APHS Premium Halftone Supreme Ortho Litho film can be used under red safelight darkroom conditions. Arista APHS Datasheet available in PDF format for download!